Mountain Biking with Pine Mtn. A recent staff ride: Mark, Jane, Henry, Dan, Alex, and Peter. The term “epic” is over-used, but it is the first thing that comes to mind when forced to describe the amount of amazing single track mountain bike trails in Central Oregon. A few other words would be fast, flowing, and endless. Just how many miles you ask? In a word: hundreds. The Central Oregon Trail Alliance maintains over 700 miles of trails around Bend and throughout central Oregon. Phil’s trail, Funner, Tiddly Winks, Metolius-Windigo, Whoops!, Flagline, Dinah-Moe-Humm, Farewell, Stormking, The Lair, or Slalom Track. These are just some of the trails you can ride to from our door. Drive a little bit and you can ride Waldo Lake, McKenzie River Trail, North Umpqua Trail, Ochoco Mountains, or Cache Mountain. Bend riding has it all, mile upon mile flowing single track, dirt jumps, lava rock, wood skinnies, there really is something for everyone. Keep in mind that in the summer a lot of the trailheads require a Northwest Forest Pass. We have daily NWF passes ($5) and the annual NWF passes ($30) at the store. Ask our staff for suggestions on planning and parking for your adventure. Can I Ride to the Trails? Yes! Pine Mountain Sports is located on the west side of Bend and we are the closest Bend bike shop to the trails. It’s an easy 2-mile ride from our store to the dirt and Phil’s Trailhead. Wanna go for a ride with us? 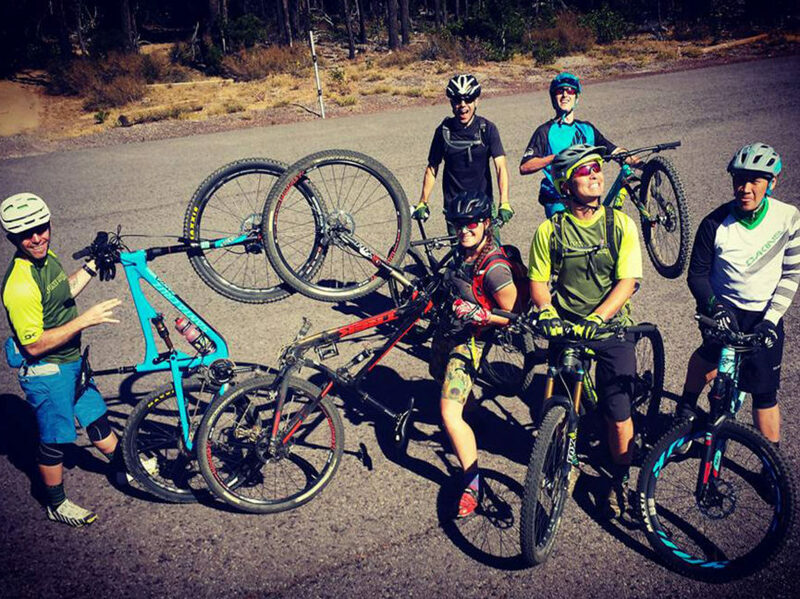 Pine University offers group mountain bike rides for guys and gals all season long. All abilities are welcome and nobody is left behind. Trek, Juliana and Santa Cruz mountain demo bikes are free for the evening on a first-come, first-served basis. Being able to repair your mountain bike on the trail will keep you safe and confident on long rides. Our Pine University clinics include free Beginning & Advanced Bicycle Repair Clinics offered April thru September. How did Central Oregon wind up with so many amazing mountain bike trails? These trails did not build themselves. Our Central Oregon Trail Alliance was founded in 1992 by a small group of trail users and have grown into the 700 miles of trails that we all enjoy today. All of these local trails are planned, designed, and maintained by volunteers like you. We encourage you to support the Central Oregon Trail Alliance with a day of trail work, an annual membership, or a simple donation. Guided mountain bike tours and shuttles are provided by our friends up the road at Cog Wild Bicycle Tours. During riding season they have a daily 10:20A shuttle that picks up riders and bikes in front of our store. Contact Cog Wild directly for shuttle details and times, and to reserve your seat on our 10:20A shuttle. It’s a far cry from Whistler, but our local mountain is adding more and more downhill trails to the Mt. Bachelor Bike Park. A 20-mile drive from Pine Mountain Sports, the Bike Park has a great mix of trails for kids, beginners, and intermediate riders. A lift ticket is required and a full face helmet and protective gear is recommended. Our favorite bikes for the conditions up there are a 6-inch travel bike like the Trek Slash and Santa Cruz Nomad. A full-on downhill bike may be overkill for most trails. Keep in mind that the Mt. Bachelor Bike Park is covered with snow for a lot of the year, so opening dates are often after July 1. Fat biking in Bend is fun year-round, but if you’re looking for snow here’s a few suggestions. First off, read COTA’s Winter Fatbike Trail Tips. Then, please don’t ride at Virginia Meissner Sno-Park. Central Oregon has over 250 miles of local snowmobile trails, so there is ample groomed riding. Fatbikers should make way for snowmobiles (as fatbikes on the trail can be hard to see and unexpected) and depending on where you start, it can be a noisy experience. When the snow conditions are good, there are two pop-up fatbike-specific groomed trails (usually a 3 and 6 mile loop) at the Wanoga Sno-Park. When these trails are open, they are detailed at BendTrails. There is also a very good Facebook group page called Central Oregon Fatbikes. Can I Ride my E-Bike in Bend? Pine Mountain Sports does not support e-bikes like the Trek Powerfly on our singletrack trails because they are not legal on singletrack that is within the US Forest Service (which includes most trails in Bend). We are fortunate to have access to amazing mountain bike trails on USFS land in Central Oregon and none of us wants to jeopardize that access. We’ve listed the local e-bike trail restrictions that we are aware of in a Pine Mountain Sports blog post. 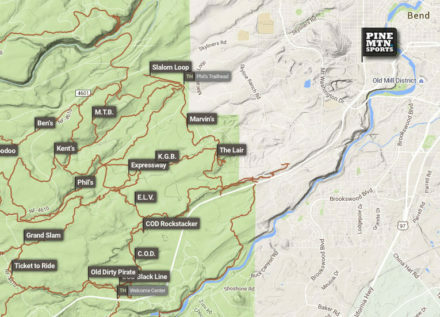 If you’re looking for conditions regarding a specific mountain bike trail, we use an on-line mountain bike map from BendTrails that allows you to get the current trail conditions from other users. TIP: Open this on your phone (it’s on our website) and it will allow you to see your location on that map while riding (as long as you have service, which can be sparse in places). Unfortunately forest fires in Central Oregon are not uncommon. Smoke conditions can vary from day to day depending on the wind. Curious where the smoke is from? What is the current air quality? And finally, for current mountain bike trail conditions feel free to call us at the store. It’s a bummer to have to talk about this, but people get their bikes stolen in Central Oregon. Why? Well, like a lot of riding destinations, there’s a LOT of nice bikes rolling around this town. And, sadly, a lot of the time these bikes are not locked up or are left in places where it’s too easy to steal them. Our recommendation? Here’s our suggestions on How To Not Get Your Bike Stolen In Bend. We also recommend registering your bikes on Bike Index. The Best Mtn. Bikes from Trek, Juliana, and Santa Cruz. Pine Mountain Sports is serious about mountain bikes. We’re the only Trek bicycle dealer in the world that only stocks and specializes in their mountain bikes. Our showroom doesn’t house any road or comfort or hybrid bikes. Just the very best Trek mountain bikes – all under one roof. Pine Mountain Sports is one of the biggest Santa Cruz and Juliana dealers in the country. 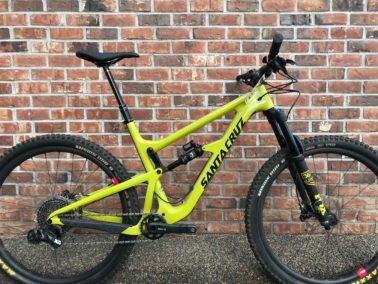 Fewer than 10 other dealers in the United States stock and sell as many Santa Cruz and Juliana mountain bikes as we do each year. When it comes time to buy, demo, service – or just talk about mountain bikes, our staff is ready to help. Up Next @ Pine Mtn.